In Part One of this series we were introduced to Lord George Gordon, a British aristocrat and member of parliament who was a radical republican, anti-establishment anarchist. After becoming embroiled in anti-Catholic activism, he spearheaded a campaign to undo a new law that relaxed restrictions against Catholics. This led to some of the worst riots ever seen in London, that became known as the Gordon Riots. Accused of instigating the riots, he was arrested for High Treason, a crime that carried the death penalty. The trial began on February 5, 1781. 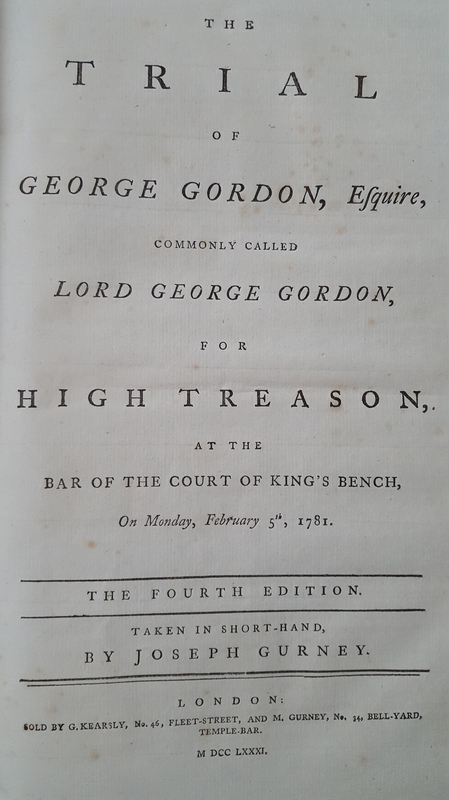 Gordon was accused of ‘maliciously, traitorously and unlawfully planning to execute a war against the King’, and of then personally launching that war with a mob of armed men on June 2, 1780. Both sides presented their evidence, and the witnesses were cross-examined. The principal defense lawyer was Thomas Erskine, a brilliant trial performer, and later Lord Chancellor of the United Kingdom. Erskine’s closing speech is purported to have been the best of his career. 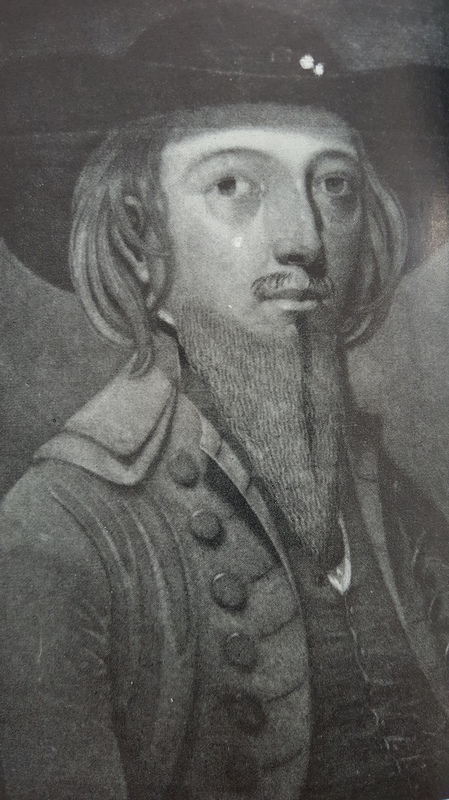 He argued that Gordon’s intentions had been peaceful, and he could not be held responsible for the actions of rioters, many of whom were not even members of the Protestant Association. Ideology was not treason, nor was advocacy for the repeal of a pro-Catholic law. The fact that there were those who had resorted to violence was not his crime, even if they had committed crimes. There was no evidence he had incited them, or encouraged them, and he had even made efforts to disperse them. Perhaps he was guilty of a lack of foresight, or of gross naiveté, but that is hardly High Treason. The jury was mesmerized. Despite a highly biased summing up by the judge, who tried to undermine Erskine’s arguments, the Jury returned a unanimous verdict of ‘not guilty’, and Gordon was released. He did not seem euphoric. Nine months in the Tower of London had changed him profoundly. He had become deeply attached to religion and to the Bible. His previous life of wild parties and loose women was abandoned for one of introspection and prayer. Although he was still outspoken and extreme, he was somehow more reflective and serious. He made a couple of attempts to rejoin the political world, but was quietly prevented from doing so by others. Eventually the world moved on, and he disappeared from sight. Then, in 1786, he was arrested on two charges. An investigation into a couple of anonymously published incendiary republican pamphlets concluded that he was their author. One of them had libeled the French queen, Marie Antoinette, as well as the French Ambassador to Great Britain. The second had attacked the judiciary. This time around there was no support from family and friends, and Gordon was forced to undertake his own defense at two separate trials. His handling of the cases was a farce, and in June 1787 he was found guilty of all the charges. The judge retired to consider the sentences overnight, and Gordon, who had been bailed until sentencing, left the court that evening and disappeared without trace. The next day the court reconvened, but Gordon was nowhere to be found. Sightings were reported in multiple locations, but each time the trail went cold. Seven months later, in January 1788, he was finally located in Birmingham, and arrested. Except that this wasn’t the Lord George Gordon of the House of Commons, and the Gordon Riots. What the police found in the shabby rented room was a bearded orthodox Jew dressed in a Polish kaftan and black broad-brimmed hat, who gave his name as Yisrael bar Avraham. At first he refused to accompany the policeman back to London because it was on Shabbat, but a magistrate was hauled in to rule that he must be compelled to travel, and so, with a package of kosher food supplied by his landlady, he was unceremoniously transported to London. It didn’t take long for the whole strange story to emerge. On the fateful night he had disappeared, he fled for Holland, but upon his arrival, the Amsterdam authorities had immediately repatriated him. When he arrived back in England he seems to have slipped into the country and vanished. This was because a year earlier he had converted to Judaism, and he now began to wear Jewish clothes and grew a beard, and in this guise became unrecognizable. It seems that this metamorphosis had been going on for some time. Some years earlier Gordon had come to see Christianity’s rejection of the Old Testament as hypocrisy and sacrilege. Someone fatefully introduced him to the Jews, and he suddenly saw them as the only people who ‘literally adhered to the Laws of Moses’, and began to keep kosher and study Torah with Jewish commentaries. His actual conversion was not easily achieved. 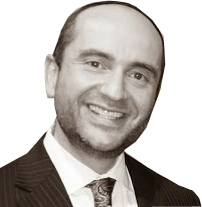 When he first became interested in Judaism he approached the distinguished and widely respected Chief Rabbi of London, David Tevele Schiff, who turned him away and refused to consider the conversion under any circumstances. Gordon was far too high profile and controversial, and welcoming him into the Jewish community might result in extremely negative repercussions. So Gordon went instead to Aaron Barnett, the learned chazan of the Hambro Synagogue breakaway community. Barnett sent him to the spiritual leader of Birmingham, a man called Rabbi Jacob, who arranged for his circumcision and mikvah immersion, and also taught him Hebrew. After the conversion was done, Gordon returned to London and was called up to the Torah at the Hambro Synagogue. In gratitude he presented the synagogue with a generous donation. It quickly became evident that Gordon’s Judaism was extremely sincere. He sat for much of the day in tefillin, praying, studying the Hebrew language and learning mishnayot. But the conversion had been kept a total secret. His family was completely unaware of it, as were his political acquaintances. After his arrest, however, hos conversion to Judaism and his new appearance emerged into the public eye, and Gordon became the focus of ridicule and scorn. His escape and disappearance, and perhaps his conversion to Judaism, resulted in the full weight of the law being brought to bear against him. The court handed down a sentence of five years in jail, and he was fined an astronomical sum of money, well beyond his means. He was brought to Newgate prison and – with intervention from his family – given a private cell in a more salubrious part of the prison facility. Gordon soon became a celebrity prisoner, and he entertained a constant stream of visitors. He held regular dinner parties, and even full-scale balls, at which he played the bagpipes. One regular visitor was Prince Frederick, Duke of York, second son of King George III. The Duke even lent his chamber orchestra to Gordon for prison parties, which, by all accounts, were the hottest ticket in town. His prison suite was strictly kosher and he had both a Jewish and non-Jewish maid to cook and clean for him. He was allowed to hold a minyan on Shabbat and festivals, and he arranged for Polish Jewish immigrants who were also imprisoned to make up the minyan together with him. His tolerance for people of all pursuasions was incredible, except if someone was a lapsed Jew. On one occasion a Jewish beggar in need arrived at the jail to see if he could visit the famous prisoner to ask for financial help. As instructed by Gordon, the guards refused the man entry, as he did not have the traditional Jewish beard or head covering. The man in question, Angel Lyon, was deeply hurt, and wrote Gordon a letter to express his disappointment. In the letter he cited God’s statement to the biblical prophet Samuel in which He said that He judged people by what was in their their hearts, not by their appearance. When Gordon’s mandated sentence was over in early 1793 he was brought before the court. The judge demanded that he pay the fines, which remained unpaid, otherwise he would have to continue his incarceration. Gordon was unfazed and accused the court of using the astronomical fines as a ruse to ensure his imprisonment for life. During the entire proceedings he refused to acknowledge that the court had any jurisdiction over him now that he had served his sentence, and on a number of occasions his acerbic wit, mainly directed at the judge, saw the gathered spectators reduced to fits of helpless laughter. His brother, the Duke, had indicated the family’s willingness to pay the fines, but Gordon refused on principle, and in the end he was sent back to Newgate Prison. As it turned out this was a fateful decision. The prison was in the midst of a dangerous outbreak of typhus, and prisoners were dying on a daily basis. Despite his isolation from the other prisoners, in October he contracted the deadly disease and began to sink rapidly. He was visited by hundreds of well-wishers, but was soon on his deathbed. On 1 November 1793 – 26 Cheshvan – Yisrael bar Avraham Gordon, Ger Tzedek, died at the age of 42, whilst singing Adon Olam with his last breath. As a final indignity, despite his desire to be buried in the Jewish cemetery of London, his family had him buried in a Christian burial ground at St James’ Church on Hampstead Road, in Euston, Central London. For some time after his death Gordon retained a certain notoriety, particularly because his extreme views on liberty and democracy had become mainstream in America and France, and he was viewed as a pioneer champion of the libertarian ideology. In 1795 a book was written and published by the fierce anti-Catholic Gordon acolyte Robert Watson, called ‘The Life of Lord George Gordon’. Watson was a Scot by birth, slightly older than Gordon, and had served in Washington’s army against the British. From 1780 he was Gordon’s secretary. The book was an apologetic work, extremely sympathetic in its portrayal of Gordon, although its author was clearly not a lover of Jews, and he wrote that had Gordon been released he would have given up Judaism and returned to Christianity. Shortly after Gordon died a one penny token was issued depicting his profile. In the 1790s the lack of copper coins in Britain and the need for small change because of the Industrial Revolution led to numerous private token issues. Some used these coins to praise the achievements of the Industrial Revolution; others used them for political propaganda, such as those issued by the left-wing publicist Thomas Spence. The Gordon penny was one of those issued by Spence. What is fascinating is that it depicts Gordon as he looked as a Jew, with a hat and beard. As the years went by Gordon was more-or-less forgotten, remembered only for his role in the Gordon Riots, and as a political sideshow of the late eighteenth century. But for Jews he remains one of the most enigmatic converts to our faith of the early modern era – a true revolutionary, and at the same time a mitzvah observant Jew who was willing to sacrifice everything for his newfound faith. Tehi Zichro Baruch.